A basic, everyday pancake recipe that everyone will enjoy! 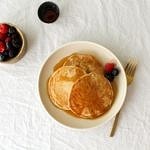 Top with fresh berries and pure maple syrup for a healthy start of your day. Preheat: If using griddle preheat to manufacturers instructions. Serve with syrup, fresh fruit or any dessert sauce of choice. To make a vegan buttermilk, add juice of 1/2 lemon to the milk and let rest for about 10 minutes. If using a heavier flour, such as oat, whole-wheat or whole-spelt flour, you may need to add a tad more milk to the batter before cooking. For thinner pancakes add a tad more milk. Make gluten free by using gluten free all purpose flour or other gluten free flour of choice.